I know the bakfiets is made to live outside, but I'm sure that keeping it dry when not in use will only prolong its life. 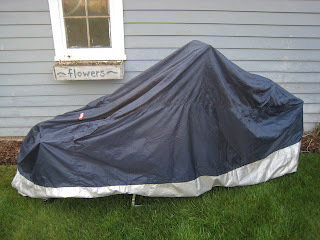 This is a motorcycle cover that happens to fit the bakfiets perfectly. It's only water-resistant, not waterproof, but every little bit helps. It takes only a few seconds to put on and take off. There are bungees and drawstrings underneath if you wanted it on a little more securely. Some showers today gave me a chance to test it. The cover sagged over the cargo box and a small pool (about a foot in diameter) formed on top of the cover. Some of that soaked through and there was about a half-cup of water in the box. The rest of the bike was dry. I put a plastic shopping bag over the saddle to ensure it stays dry even if some water does get through the cover.